1. iPhone 8 hits stores: Two new iPhones go on sale in Apple (AAPL) stores around the world today. The iPhone 8 and 8 Plus got less attention than the flashy tenth anniversary iPhone X when they were unveiled last week. But both versions of the 8 come equipped with wireless charging and new cameras, and will get to customers much sooner than the X, which won't start shipping until Nov. 3. Some analysts have suggested the later delivery for the iPhone X could mean Apple won't see a spike in iPhone sales until 2018. Apple's annual sales declined in 2016 for the first time since 2001. 2. It's all politics: The U.K. and Germany are in the spotlight Friday as British Prime Minister Theresa May is set to give a high-profile speech about Brexit and German Chancellor Angela Merkel heads into a Sunday election. May will try to get faltering Brexit negotiations back on track on Friday as she makes a speech in Florence, Italy. She is likely to commit Britain to continue paying into the European Union budget in return for continued access to its free trade area for two years after Brexit, according to multiple British media reports. Meanwhile, Merkel is expected to wrap up campaigning. Opinion polls show she is on track to win a fourth term. 3. Market movers: Shares in cosmetics giant L'Oreal (LRLCY) are surging by about 4% in Paris following the death of Liliane Bettencourt, 94, the L'Oreal heiress and world's richest woman. "Based on our understanding of the shareholders agreement, this event could trigger changes to the relationship between Nestlé and the Bettencourt family," noted UBS analysts in a research note. The Bettencourt family owns a 33% stake in L'Oreal, while food company Nestle (NSRGY) owns a 23% stake. UBS analysts believe it's possible Nestle may now want to increase its stake in L'Oreal. In the U.S., shares in Carmax (KMX) and Finish Line (FINL) could be on the move as both companies plan to release earnings before the opening bell. 4. Eyes on oil: OPEC oil ministers meet in Vienna with some of their counterparts from non-OPEC oil producers. They are meeting to decide whether to extend an agreement to curb production -- which is due to expire in March 2018 -- or to sit tight to see what happens to oil prices in the coming months. U.S. crude futures are currently trading around $50 per barrel. 5. Stock market overview: The enthusiasm that helped markets set records this week has drained away. U.S. stock futures were slipping lower, and European markets were mostly negative in early trading. 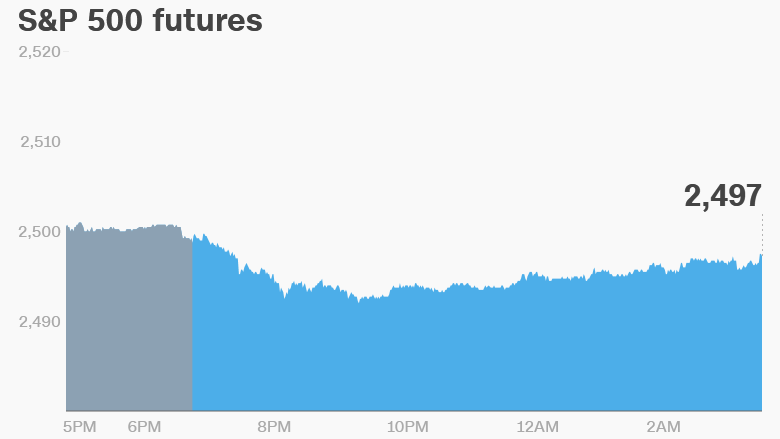 Most Asian markets ended the day with losses after North Korea warned Thursday that the country could test a powerful nuclear weapon over the Pacific Ocean in response to President Trump's threats of military action. Foreign Minister Ri Yong Ho told reporters that the ultimate decision, however, was up to his boss, Kim Jong Un. On Thursday, the Dow Jones industrial average declined by 0.2%. The S&P 500 and Nasdaq dipped by 0.3% and 0.5%, respectively.